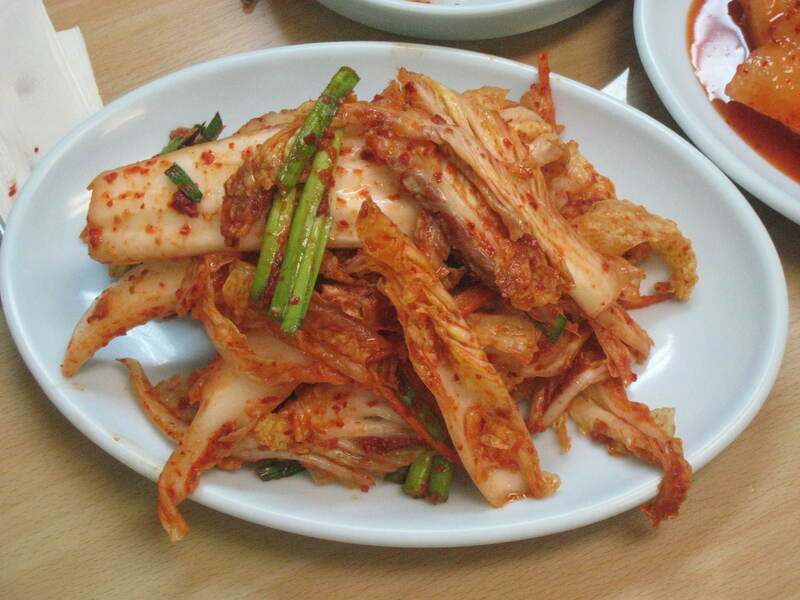 After walking up the steps to Jang Tur Noodle and entering the very brightly-lit restaurant, the smell of cooking cabbage almost overwhelmed me. I was the first to arrive at the Korean noodle shop I chose in the Korean enclave of the Asian community of Flushing, just off Northern Boulevard. And after a few whiffs inside the restaurant, even with the door open on an early winter evening, I was tempted to send out an all-points bulletin via my cell phone that we should find another venue—there certainly were plenty within the vicinity. But it was too late—I could see Gerry, Eugene, and Mike from Yonkers through the glass windows as they climbed the steps that led to the Jang Tur’s entrance. I didn’t say anything about the smell; I was waiting to see if any of the others would comment. No one did and maybe it was because the door was open for a bit. Or maybe because I was becoming acclimated to it that I no longer found the smell offensive and instead of my stomach wrenching, it was now clamoring for sustenance. The restaurant’s lone waitress brought us plastic glasses of what looked like beer but was actually warm, barley tea. 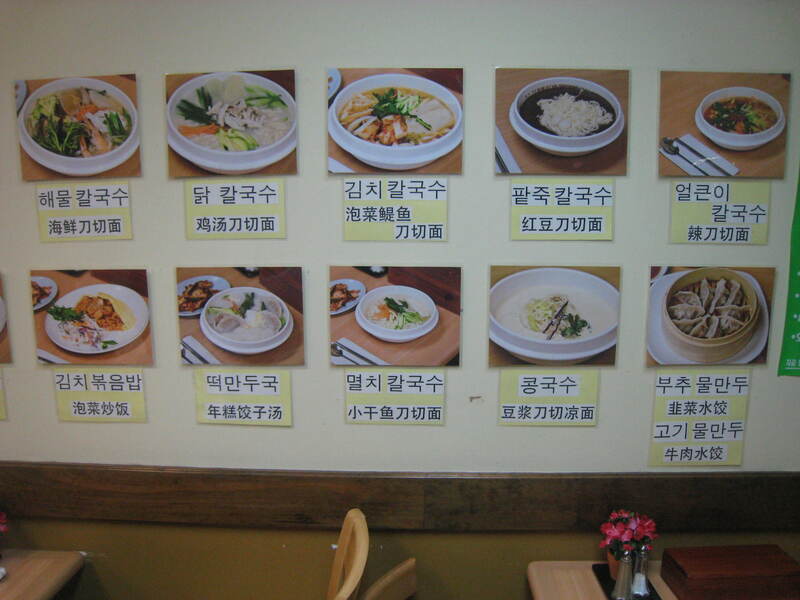 There were pictures of the noodle dishes offered on the wall with descriptions of them underneath. The descriptions were in Korean only and the waitress spoke no English. There were, however, a few laminated one page menus that did give English translations of the noodle dishes offered. I’ll take the one with the noodles. While we waited for Rick, Eugene chatted about the five Christmas parties he was soon to attend including one that featured a “Viennese” table. Rick’s arrival saved us from hearing more about the Viennese table and, with the exception of Zio, all were present. 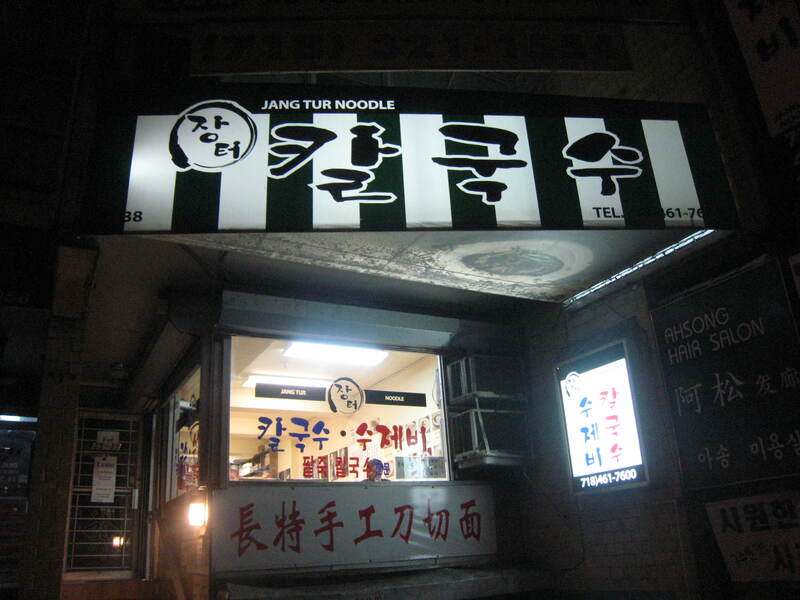 The noodles at Jang Tur were, according to the English-language menu, “hand cut or hand torn and made on the premises daily.” There were also two variations of dumplings, chive and beef and when the waitress came to our table we pointed to them. And then doing more pointing, we picked out our noodle bowls. When I arrived, there were two diners in the tiny restaurant, a man and a woman. The man was slurping magnificently. I peered to see what it was he was so proficiently devouring. It was a bowl of something dark red, almost clay-like in color. 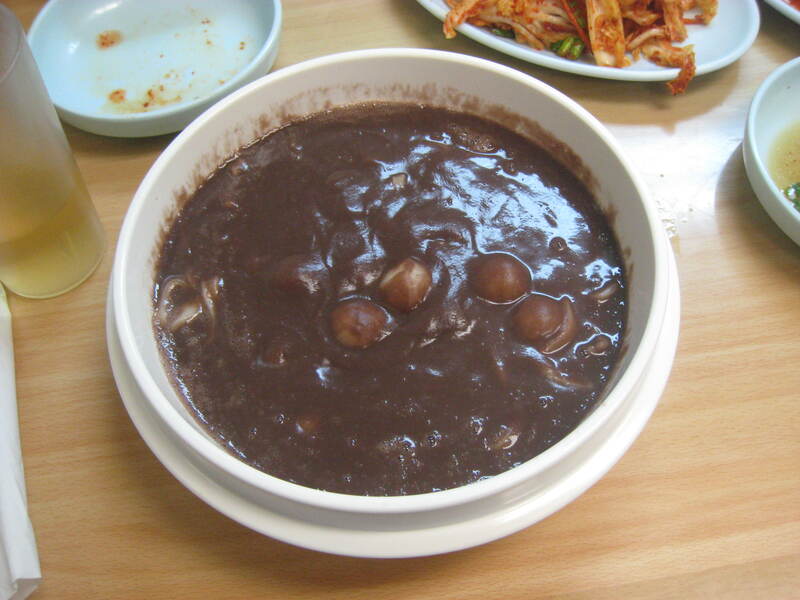 It could only be the noodles in red bean porridge. If he was having it, I wanted it too. “Red bean?” our waitress said in her very limited English. She wanted to make sure that it was really what I wanted. I confirmed with an enthusiastic nod. Mike from Yonkers pointed to the noodles in spicy anchovy soup on the menu, Gerry the rice cake and dumpling soup, and Rick, the stir fried squid with rice. Instead of pointing, Eugene insisted on speaking in loud, clear English and asked for the noodles in a spicy red pepper sauce with vegetables. Our waitress looked at him blankly. He then pointed. She nodded. “No, mushrooms, right?” he bellowed as if she had any idea what he was asking. We’ve learned over the years that Eugene has an unusual aversion to mushrooms that’s so drastic it’s as if he has a life compromising allergy to the fungi. “Mushrooms,” she mouthed like an alien learning the language of the foreign intruder. Eugene shook his head again. “No mushrooms,” he repeated. Mimicking Eugene, she shook her head too and said, “No mushrooms.” Apparently that was enough to satisfy Eugene and we were spared anymore mushroom discussion. The dumplings arrived along with big bowls of kimchi and a spicy, pickled squash. The dumplings were light as tissue and perfect with the salty dipping sauce that accompanied them. The steaming, dark red porridge came next. I took a few bites. At first it was bland, like porridge can be, and negotiating the thick noodles with the silver chopsticks at the table proved troublesome. 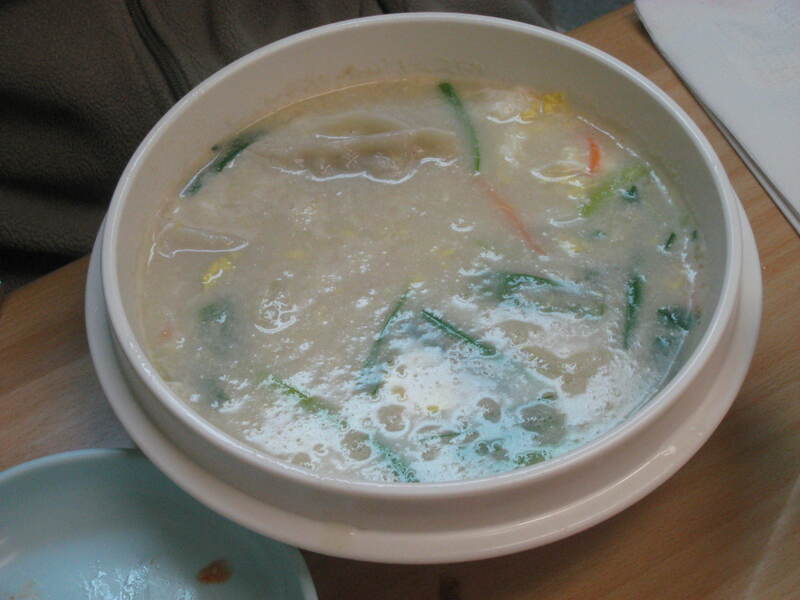 In the bowl also were small dumplings similar to those found in traditional chicken and dumpling soup. I added a bit of the hot pepper condiment to give it a little bite, but it wasn’t needed. What started as bland evolved into a comforting, unique taste. Mike from Yonkers was struggling with his soup; taking tiny sips because of the intense spice of it. Soon his nose was flowing freely and he was honking loudly into a handkerchief. Eugene incorporated the Sicilian method to eating noodles, using a spoon with his chopsticks. He had no complaints about the heat. 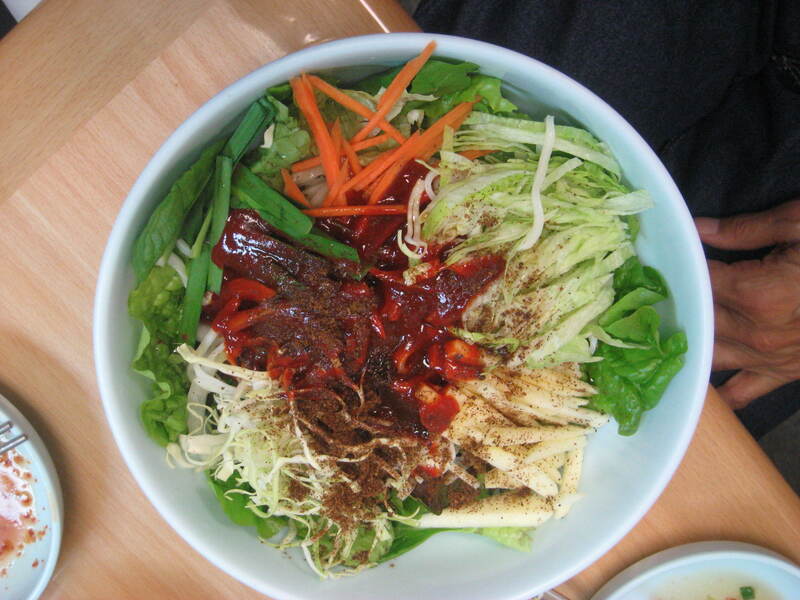 “It’s like a noodle salad,” he said of his bowl. Eugene’s “noodle salad” sans mushrooms. While Rick was picking out the larger, tough pieces of squid from the smaller, more tender ones on his plate, Gerry was deliberately sipping his soup; savoring it. 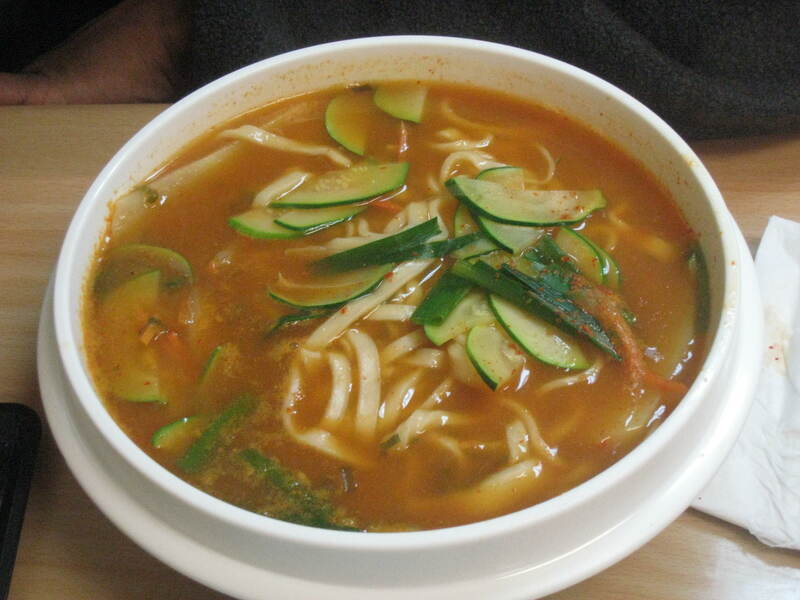 “The best soup I’ve ever had,” was the supreme compliment he uttered after finishing it. “The Best Soup Ever;” so said Gerry. With all the bowls just $7.99 each, we were way under budget. We had some extra time so we crossed Northern Boulevard and entered the Cool Hope Beer Hall. The “Hall” was practically empty and the five of us spread out at the bar. The television above the bar was broadcasting a Korean version of “Dancing With the Stars.” We watched silently while we enjoyed a round of soju, Korean sake, chased by Budweiser before heading back out into the winter night.